WWIIReenacting.co.uk Forums • View topic - RAMC NCO Orderly Satchel. Post subject: RAMC NCO Orderly Satchel. Having just acquired one of these, I'd like to fill it properly. Does anyone have a copy of the packing list please? Post subject: Re: RAMC NCO Orderly Satchel. Is this the one that is worn instead of the small pack? Or the one which looks like a normal shell dressing bag but with additional flaps under the lid? It's stamped NCO on the flap, slightly larger than a Shell Dressing bag. Detachable shoulder strap, no fittings for shoulder straps. Internally there's a pencil pouch on the top flap, main compartment divided into two, with a number of small straps andpouches. Detachable shoulder strap, no fittings for shoulder straps. At 0650 with a lack of coffee, anything is possible! Oh I seethe usualspace for some chinagraphs and some scissors, will get you the kit list ASAP. Sorry for the delay Simon. Trying to find it amoungst the other guff i have on my computer! I have also this satchel in my collection. Is it possible to send me the kit list too. The pack you are talking about is the "1942 Pattern, Haversack, Surgical, Airborne" - it pre dates the Don and Sugar packs. I have just uploaded photos of this haversack, contents, and descriptions onto the 16PFA website, which I have now taken over from Kenny Morland. Am re-developing the site into a bit more of an online resource into Airborne Medical equipment - lots more updates coming, so pop back on a regular basis!! Saw your recent update on the 16PFA site......glad to see that!! One question though, how many of each type pannier did the PFA have in WWII? Thanks for your comments about the website! Regarding your question about the panniers, I have to say that I'm not sure off hand! -but I should be able to dig the info out for you! 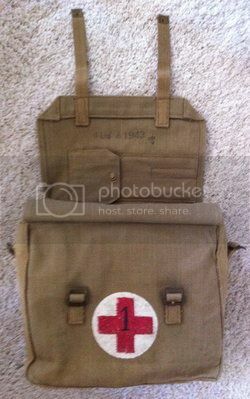 Dickie, Is this bag still used in 1944 by the Field Ambulance units at Arnhem? Although I have owned this bag for the last 10 years now, it is thanks to your website only now clear what the content is of this bag.